Halloween has been celebrated in many countries on 31 October which is the eve of the Western Christian feast of All Hallows’ Day. Today’s Halloween customs are influenced by beliefs and folk customs of the Celtic – speaking countries. In the household festivities in Britain and Ireland are included games and rituals which foretell the future, especially regarding marriage and death. Often in the divination rituals are used nuts and apples. In these rituals is included dream interpretation, apple bobbing, mirror-gazing and others. Mumming was been included in Ireland, Scotland, the Isle of Man and Wales from the 16th century. Firstly in the 19th century the local people in Scotland and Ireland started to dress up in costumes for Halloween. Halloween costumes are traditionally modeled after monsters, vampires, ghosts, witches, devils and skeletons. This festival gives you so many options to let your imagination run wild with different types of party arrangements. You can host a mysterious Halloween party for your children. Surprise them with homemade decorations with orange and black colours. You can include spider webs, pumpkins, garlands, candies, sweets and also flowers because they are one of the most important accents in every arrangement. If you are a passionate flower lover you can also make your own unique arrangement made entirely of different types of fresh orange, black and purple flowers which will be the most stunning, original and interesting party arrangement of all! The most important elements of every decoration are: Spider webs, which you can make of yarn, doilies or cheesecloth. The finishing touch of every Halloween costume is with some flower on it, this is the most original accent on every costume that will make you right away the center of the holiday! You can make a colourful wreath made of yellow, orange and black flowers or a lay that you can put it on one of your arms and legs like a finishing touch of your unique costume. That will surely grab everyone attention and looks! Halloween is a chance to run away from the monotony of the daily routines. You can invite the holiday spirit into your homes and surprise your family and friends with some fresh and colourful flowers. The flowers will brighten the whole holiday of your family making this festival experience unforgettable. What is more charming and cheerful than a lovely surprise with something so beautiful as flowers? You can show how much you cherish your special people with some lovely, fresh flowers which are a perfect gift for Halloween! 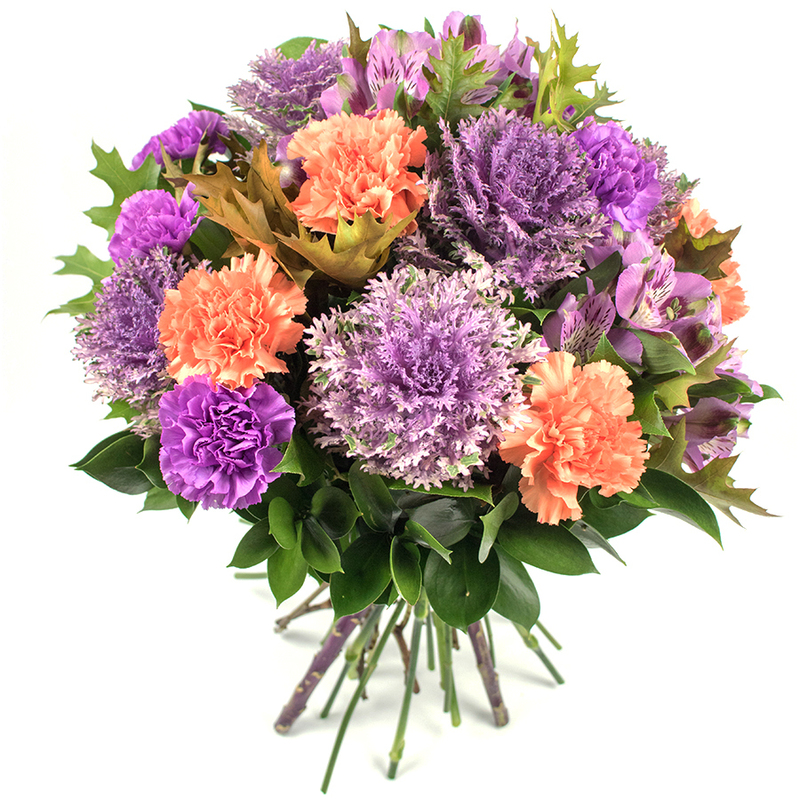 The charming, breathtaking and fresh combination of purple and orange carnations and purple alstroemeria will melt the heart of your loved ones right away when they see this beautifully arranged Halloween bouquet! This heartwarming hand tied bouquet will charm everybody just with the first look they have on those fresh and colourful flowers! 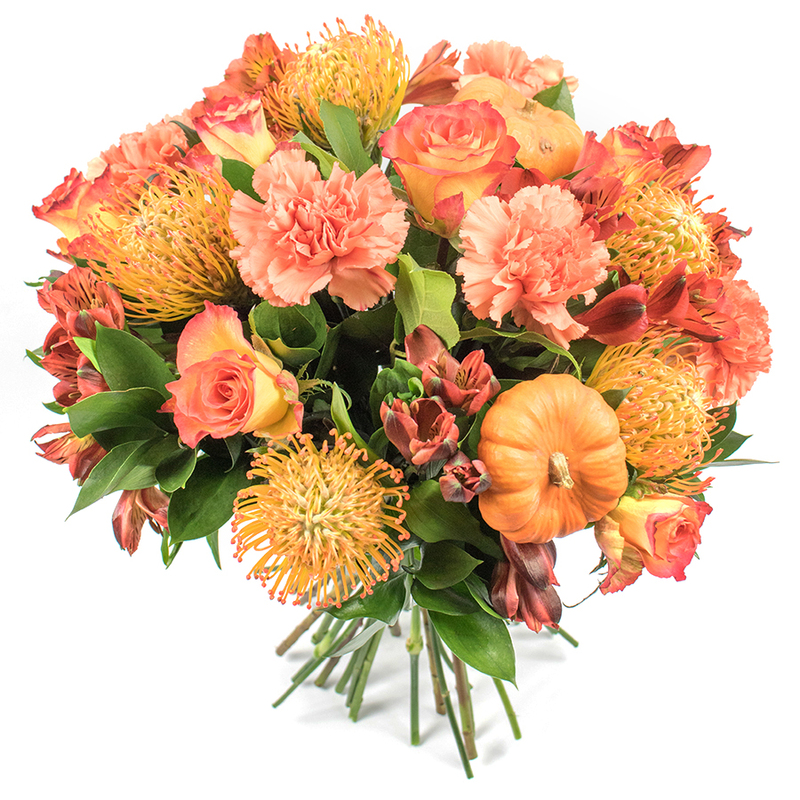 The unique combination of orange carnations and roses, red alstroemeria will make your close people smile and feel the holiday spirit making this festival an unforgettable one! Halloween is the most fun, creative and original holiday of all- for children and adults!